After a near ideal growing season, wet weather is causing nasty issues like the threat of moldy corn. Given the quantity of rain we’ve received lately, be on the lookout for moldy corn. Mold can harm livestock and create problems in the food chain. Buyers are on the lookout for mold. So if you suspect you have it, and you have crop insurance, contact your agent before you harvest. Your insurer will follow up and tell you how to proceed. There’s tons to know about corn ear rot and you have Drs. Damon Smith and Paul Mitchell on your side to help fill you in. You can read their full post about this topic here. In a nutshell, there are molds and there are really bad molds—ones that can produce toxins called mycotoxins that can threaten livestock who eat it. Grain buyers are actively on the hunt for mycotoxins to be certain anything they accept is below FDA action levels. You can reduce mycotoxin risk. How? Check for moldy corn before you harvest as well as monitor the grain for mold. Just because mold is present does not mean mycotoxins are present—and, sadly, vice versa. If your alarm bells are ringing. collect smaples and have them tested at a reputable lab. Your corn agronomist or local UW Extension agent will be happy to work with you to collect samples properly and identify a trustworthy lab. Here’s the main point. If your sample comes back high in mycotoxins—and we cannot stress this enough—do not blend that grain with uncontaminated corn. So, what are you to do if you observe mold during harvest? Here are five concrete suggestions. Dry your corn properly as higher moisture creates a preferable environment for fungi growth. (For short term storage, aim for 15% moisture at a cool temperature of 55 degree Fahrenheit. For longer term storage, or storage in toastier months, aim for 13% moisture or less. Finally, keep your storage facilities clean. Mycotoxins are quite stable—freezing, drying and heating do not bother mycotoxins once they’re in your grain. Want to know more about storing mycotoxin-affected grain? Read up on it here. Finally, quality losses due to moldy corn are insurable losses if you’re insured—but you must follow the rules to secure your claim. Protect yourself: the best practice is communicate with your crop insurance agent before harvesting any corn you suspect has mold issues. Some insurers prefer you leave unharvested rows in the field to allow crop loss adjustors to determine idemnities on the ground. If you discover it along the way, let your agent know. Use that mobile phone—especially before you store or sell that grain. If you have a contaminated crop. your agent will tell you how to proceed. With mold and crop insurance, fast, accurate reporting wins the reimbursement. With torrential rainfall comes the natural question of assessing flood damage in soybean fields. Go here for timely, accurate management information developed by Shawn Conley and Grove Shannon. Asian Soybean Rust could have a serious impact on Wisconsin soybean crops. That’s why it’s essential to know the signs of the disease—especially since some symptoms of the blight are common to other infestations—and to keep a close eyes on your crop. To help look for the disease, Wisconsin uses sentinel plots as an early warning system. This is part of a national sentinel plot monitoring effort made up of over 30 states. The sentinel plot network uses trained observers to look for signs and symptoms of rust. Most Wisconsin soybean growers will have a sentinel plot within their county or in a border county. These sentinel plots are monitored through a combined force of UW county extension agents, agriculture research station staff and UW-Madison campus research staff. You can see the sentinel plot observations for yourself here on the USDA Pest Information Platform for Extension and Education (PIPE) website. Whether soybean rust occurs during early spring and summer in the Gulf coast region. This determines the amount of spores available to blow northward. (Unlike with Tospovirus, the soybean rust pathogen has not been shown to be transmitted by seed. So you needn’t be reluctant to purchased seed grown in areas where rust was found in the previous growing season). While the sentinel plots are a great precautionary step, there is an active measure you can take as well and it doesn’t cost a dime: scout your crops. There’s a two-step process for scouting. Check the lower leaves from the main stem in the lower canopy first. These leaves are most likely to show symptoms first. Why? These leaves are likely to stay wetter longer, conditions the rust prefers. Use a 10-20X hand lands for viewing and do this on site to avoid spreading spores. Backlighting might help you see. Initial symptoms include small, gray spots, often on the underside of leaves or along the veins. You might also see them on petioles, stems and pods. These spots can grow and change in color from gray to tan, reddish brown or black. It’s vital to know that these symptoms are NOT exclusive to rust (You might be seeing brown spot blight or downy mildew. If you observe symptoms, you need to verify the cause. See Common Soybean Leaf Diseases and Asian Soybean Rust (pdf) for a good overview of look-alike diseases. If you see symptoms, look for signs (sporulation) of the virus pathogen. You know the gray/tan lesions you were looking for, they mature to to form pimple-like structures called pustules on the lower leaf surface. Active pustules contain the the powdery tan spores of the rust fungus. In the early stages, these pustules look like miniature volcanoes topped by with a pore, but there is no yellow halo around the pustule. In later stages these pustules burst and release spores to spread the disease. Use your 10-20x hand lens to spot the pustules. It is critical to observe sporulation in order to diagnose rust. This is the only definitive means for diagnosis. For an excellent printable online diagnostic guide of Asian Soybean Rust, look here. Should it reach our state, Asian Soybean Rust can certainly negatively affect yields. So stay vigilant, scout your fields and ask questions if you see something that bothers you. Dr. Conley defines his job as conducting research and delivering its findings to farmers, crop consultants and technical service providers across the state. The goal is to help Wisconsin growers consistently put into the field the most “economically, environmentally and sustainable crops out there.” By doing so, farmers should both save money and improve their bottom line. Dr. Conley thinks the shortfall will be felt most at the county level. Agents may need to expand to serving other counties. This means more time spent on the road, less frequent personal contact, and possibly missing events such as field days. Dr. Conley adds that the Wisconsin Soybean Marketing Board, funded through checkoff dollars, has been helpful in supporting his research and filling the gaps. Industry also supports his efforts but with the decline in crop prices, fewer resources are available. One less obvious effect of the budget shortfall is the loss of technical expertise. After the former Extension Weed Specialist left for a job in industry, for example, the position went unfilled. That knowledge gap was felt last year when glyphosate resistant weeds affected soybean yields. As other Extension Specialists take new positions or retire, Dr.Conley is concerned other knowledge gaps will emerge that can hurt farmers. Dr. Conley takes no political stand on these issues. Instead, he urges farmers to understand the current challenges and ask questions of whomever they feel is appropriate—such as UW Extension administration, county officials, legislators and the governor. At the end of the day, Wisconsin looks to its farms and farmers to feed our state and a growing world. We all benefit from healthy, sustainable farms. For the first time, a UW-Madison study has proven a crop-injuring Tospovirus can be passed from soybean seeds to plants, a finding with significant implications for soybean production around the world. The landmark study shows the virus can spread from an infected seed lot to seedlings at a rate of 6%, which affects seed quality and reduces total oil content. Until now, Tospovirus transmission in this manner was unproven and thought unlikely. Unchecked, the virus—called Soybean vein necrosis virus (SVNV)—could reduce the production of high quality, pathogen-free seed and soybean oil yields. 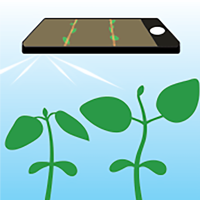 Armed with this new knowledge, soybean growers should work to preserve clean seed lots to help prevent SVNV damage in breeding nurseries and in the field. Further, UW-Madison Plant Pathologist Dr. Damon Smith urges seed producers to be diligent about scouting their crop and testing plants for SVNV so the virus is not transmitted to the next soybean generation. Given the industry demand for high-oleic production, farmers should be aware that SVNV can reduce oil content in soybeans so it’s prudent to source soybean seeds from producers who use vigilant SVNV screening measures. Dr. Smith points out there is no risk to animal or public health from Tospovirus, but reduced oil production can have a negative effect on farm profitability. The study, released on January 19, 2016, has already sparked considerable interest around the world. Further research will be needed to understand why this particular virus can be seed transmitted. Smith suspects there may be multiple strains of the SVNV virus. This work was partially funded by the Wisconsin Soybean Marketing Board in combination with funding from the USDA. Given the impact of this finding for U.S. soybean producers, this is a “must know” study with clear action steps that the growers and farmers should use from now on. Seed Transmission. PLoS ONE 11(1): e0147342. Funding: Funding for this work was provided in part by the Wisconsin Soybean Marketing Board and the USDA-ARS Floriculture and Nursery Research Initiative. The funders had no role in study design, data collection and analysis, decision to publish, or preparation of the manuscript. Dr. Damon smith talks about white mold of soybean. For every 10% increase in incidence of white mold, there can be up to a 5 bushel per acre loss in yield. This makes white mold an important disease of soybean in the North Central soybean growing region. The discussion here includes how to identify white mold, details of the disease cycle, and how to manage the disease. 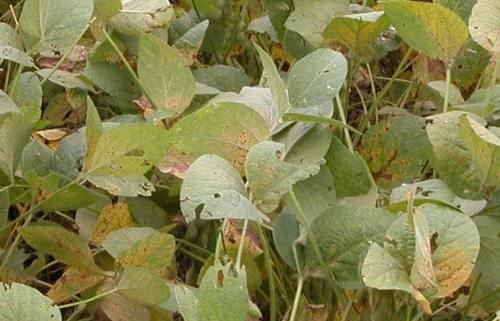 For more information about white mold visit the Soybean Plant Health Topics webpage at http://fyi.uwex.edu/fieldcroppatholog… and scroll down to the “White Mold” section.